Ladd & Kelsey designed the award-winning, thought-provoking – and controversial – Pasadena Art Museum to house the institution’s large and prestigious contemporary art collection. At the time, Pasadena was so influential in contemporary art that its only American rival was lower Manhattan. The undulating exterior — influenced by Pasadena’s Arts & Crafts tradition, Beaux-Arts City Hall, and streamline and modern design –changes with the light of day. Ladd & Kelsey’s signature white concrete base and white-finished roof crisply contrasted with the blue Southern California sky and green landscape. The curvilinear tiled exterior, a Ladd & Kelsey hallmark, is comprised of 115,000 Edith Heath-designed custom brick red and onyx glazed 5 x 15-inch tiles. They embrace the palette of the San Gabriel Mountains above the structure and their mood still changes with the day’s light. 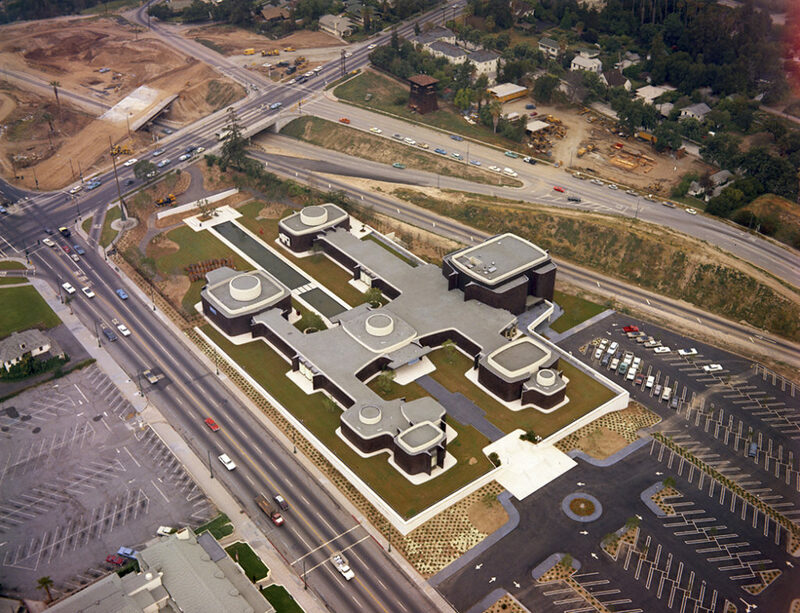 For Edith Heath, the project earned her the prestigious AIA Industrial Arts Medal award from the American Institute of Architects in 1971. This was the first time the award was granted to a non-architect. The avant garde interior architecture housed equally avant garde contemporary art. The interior plan was imagined as a series of pavilions by which one crosses glass-enclosed “bridges” with views to nature outside before entering another pavillion. The interior was designed to be an unconventional space to house unconventional art by the likes of Robert Irwin, Ed Moses, Ed Ruscha and Ellsworth Kelly, among others. 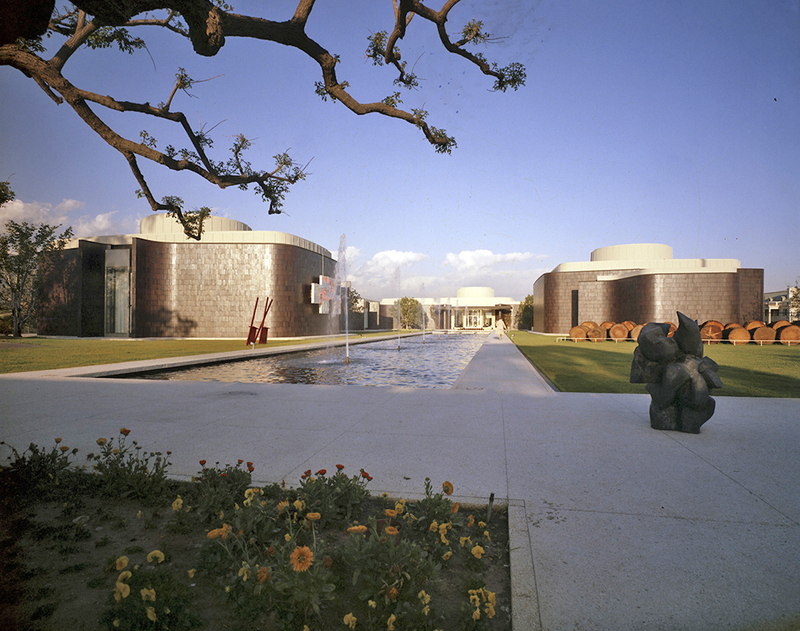 A debt-laden Pasadena Art Museum was taken over by the industrialist Norton Simon in 1974, leading it to become the Norton Simon Museum. The structure’s original interior architecture was altered in 1977 by Craig Ellwood and largely lost to a 1996-1999 Frank Gehry redesign. The classical modern reflecting pool central to the plan was demolished in 1999 and replaced with an organic landscaping redesign by Nancy Goslee Power.